I also work with a variety of partners, usually other consultants or facilitators, adding the power of graphic facilitation to their work. As a facilitator myself, I’m better able to help them integrate the use of graphics into their existing practice, while opening up new possibilities for them to explore. My partners find me easy to work with and ﬂexible, attentive to the needs of both themselves and their clients at every turn. Smooth from the beginning, working together over time we’re able to form partnerships that are supple and natural. Ultimately, the beneficiaries are the groups we work with, whose meetings become more vibrant, effective and alive . My partners are consultants or facilitators who have an established way of working, but realize that graphic facilitation could make their meetings even more productive. I help them explore a full a range of options, from simple graphic capture to the design of graphically-enhanced processes or graphic templates. They’re able to rely on me to manage that aspect of the work, thereby gaining enough understanding to maximize its potential, without having to develop their own expertise. In meetings, I can adjust on the ﬂy, supporting their decisions in the moment and helping to redesign tools and processes if needed. My clients ﬁnd me calm, steady and ﬂexible, attuned fully to the group and to themselves. I think about meetings as a facilitator does, which allows me to follow my partners’ moves quickly and easily. This ability to follow closely, while also being able to suggest alternatives when needed, makes our work together smooth from the beginning and seamless over time. With my longstanding partners, our work together has become even lighter and more ﬂuid. Their clients experience us as a powerful and highly skilled team. 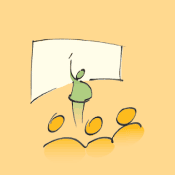 Most facilitation benefits greatly from the addition of graphic facilitation. In any meeting where participants come together to think, consider and decide, being able to see the whole conversation gives participants immediate and ongoing access to the full landscape of their discussion, enabling them to build upon it as needed. Beyond this, using drawings stimulates imagination and brings ideas to life. The result is that your group is able to think better and faster, with less effort and more enjoyment in the process. The experience of being in a graphically facilitated meeting is memorable. Participants have a different, deeper experience of conversations when they watch as well as hear them unfold. They are able to ﬁnd their way back through a conversation on a chart, having been there as it emerged in real time. This makes digital copies of charts invaluable for reminding participants of previous meetings. During the meeting, having the full “memory theater” of completed charts displayed both allows a group to ﬁnd its way back to earlier parts of the meeting, as well as to have a visceral sense of all they’ve accomplished.